Scobie Malone’s job as a homicide cop is to try to keep murder at bay. His job as a father is to keep his family safe. Now, as the eyes of the world are turning toward his city, both of Malone’s careers are in serious jeopardy. An important politician is murdered in high-profile public as his nation rushes toward center stage in the international arena. The assassination is clean and professional — and senseless on the surface. Malone knows, however, that violent death is sometimes politics’ strangest and darkest bedfellow. And before thousands of visitors descend on his city, the dedicated detective will have to put himself in the line of fire to flush out a killer. But he won’t be alone in someone’s rifle sight. An ambitious young reporter will be joining Scobie Malone in harm’s way: his daughter. 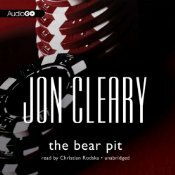 Bear Pit is a good follow-up to Five Ring Circus, the last Scobie Malone mystery I listened to. The Olympics are coming to Sydney and in the early story the Olympic Tower project was the center. This time around a major politician, a character we’ve grown to respect if not necessarily like throughout the series, is assassinated just outside that same building. They went and changed the narrators on me and I don’t approve. I don’t usually care much about the readers as long as they don’t get in the way of my enjoyment of the story. That being said, Rodska’s Malone and the other characters were tougher somehow than they were before. The dialogue’s the same, but the attitude is different and it bothered me somewhat. I’ve always felt like Scobie has a sense of humor, even when he’s in a tough spot, and he’s always in a tough spot, but that just didn’t come through as well here. And Clements, his partner, seems meaner and bigger. I also did like the accent Rodska uses for Lisa, Scobie’s wife, it may be accurate but to me it was wrong, because that’s just not the way she sounds. Maybe I would feel differently if Rodska had read all the series, but the change was jarring and I never quite recovered. One thing I find annoying with Malone novels is that often the suspicion falls early on a certain character and never really waivers, even if the evidence is flimsy. And it turns out the suspect actually did the killing. That’s what happens, here, sorry for the spoiler, but it takes a while for Scobie to be able to prove it and then it’s only by luck. The big question is who paid the killer and was the bullet meant for the politician or one of his companions. It’s a very political book and I don’t necessarily understand the whole Australian election process or how the parties work on the inside, but I could probably say that about American elections too. I think this is a novel best read/listened to after some of the others, especially Five Ring Circus. There are a lot of continuing characters and I think this one would work best if already have some knowledge about them, which I did. I will say this is the first of this series where I’ve felt that way though. In general, it’s not one I think needs to be read in order. Looking over my review, it sounds like I didn’t like this one, but I did. It was enjoyable, a quick listen, and a little less black and white than some of the others have been. This was my sixth book for R.I.P. 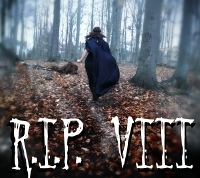 VIII, a reading event embracing the ghastly and ghostly, mysterious and grim. 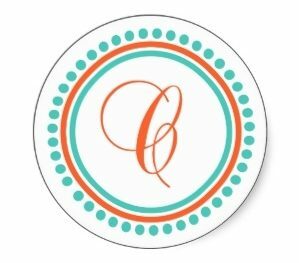 RIP VIII is hosted by Carl at Stainless Steel Droppings. Too bad they changed the narrators. It sounds like you enjoyed this one overall. Wow about this being the 6th for r.i.p! Great job. I tend to like the “mysterious” portion of RIP. Haven’t heard of this series, but it sounds entertaining. I like series that have characters that run through all of them.